As fighting intensifies and peace talks remain on rocky ground, the humanitarian crisis in Ukraine increases with each day that passes. 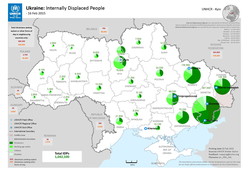 One aspect of the crisis in Ukraine is the massive surge in numbers of internally displaced people. Reports of nearly 600,000 asylum seekers fleeing Ukraine, do not include the nearly one million internally displaced people still within Ukraine’s borders. Thus far, Ukraine and the international community have struggled to adequately respond to the needs of the hundreds of thousands of internally displaced people (IDPs) forced from their homes during this violent conflict. 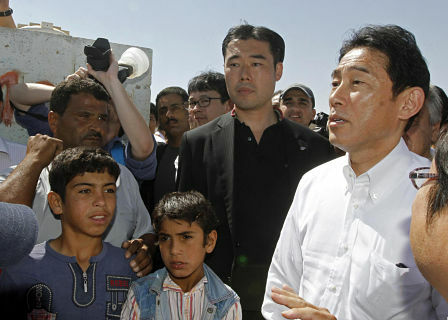 UNHCR, UNICEF, and OCHA are just a few of the non-governmental actors attempting to address the humanitarian crisis. According to its latest operational update, UNHCR has focused on the registration of IDPs, ensuring access to employment, and providing emergency shelter and non-food items, amongst many other efforts. UNICEF has focused on the health, nutrition, and education of the internally displaced children in Ukraine, while also emphasizing the need for monetary donations to continue its emergency relief. OCHA, the UN agency that coordinates the humanitarian responses to crises around the world, also emphasized the lack of funding and the need for emergency shelter and food security, amongst the many needs that must be met in Ukraine. While UN Agencies struggle to keep up with the needs of IDPs, State actors are struggling to respond to the situation. While a French-German proposal for a cease-fire has been reached but remains ineffective in some areas, the response from the rest of the European Union also appears to be focused on diplomacy. In a recent speech to the European Parliament, the EU High Representative/Vice President, Federica Mogherini, emphasized, “that there is no alternative solution to a diplomatic solution for this crisis.” Meanwhile, United States officials have continued to debate whether or not to send arms to Ukraine. While State actors attempt to determine the best course of action, Ukraine has adopted legislation concerning IDPs and the people of Ukraine are reportedly acting very generously toward IDPs. However, the question remains: how effectively can the Ukrainian government enforce its legislation and uphold their end of the ceasefire, and how long will Ukrainian generosity last, as more and more people are displaced every day? One answer to these issues is funding. Simply put, the agencies attempting to address the problems facing IDPs need the money to continue to do so. UNICEF has already spent the US$10 million dollars that have been pledged, and still lacks about $20 million in committed funds. UNHCR has reported that it needs US$41 million dollars for the situation in Ukraine, and has only received two percent of those funds. Thus far, the funds received have been from only the European Union. While it is the primary duty of the national authorities to provide assistance to IDPs, the international community can still play its part in assisting the national authorities of Ukraine. Agencies like UNHCR and UNICEF, along with many other partners, are poised to help the IDPs of Ukraine; they simply need the funding to adequately do so. It is time for the international community to step up and provide the monetary assistance necessary to provide for and protect the IDPs of Ukraine. Julie Marling is a 2L law student at University of Denver Sturm College of Law and a Staff Editor for the Denver Journal of International Law and Policy. The Ved Nanda Center, the Western Union Foundation and the USA for UNHCR cordially invite you to a reception honoring the United Nations Refugee Agency. 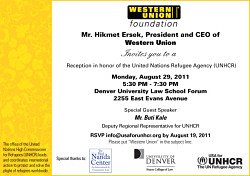 The Reception will take place in the University of Denver Sturm College of Law Forum from 5:30 to 7:30pm and will feature special guests Mr. Buti Kale, Deputy Regional Representative for UNHC and Mr. Hikmet Ersek, President and CEO of Western Union. Please RSVP by Monday August 22nd to Karlyn K. Shorb, Administrative Director of the Ved nanda Center for International and Comparative Law at the University of Denver Sturm College of Law: Phone: 303-871-6655; email: kshorb@law.du.edu.